Advantech’s innovative MI/O (Multiple I/O) Extension Single Board Computer all feature flexible and integrated multiple I/O to help aid efficient development, reduce resources, and assist integrators to provide optimized solutions in a more cost-effective way. By connecting with MIOe I/O extension modules which support additional extended unified interfaces including: DisplayPort, 4 PCIe x 1, LPC, SMBus, USB 2.0/USB 3.0, audio line-out and power, customers receive the best I/O choices to fulfill vertical application development as well as helping them retain their specialist domain knowhow. These features are all part of Advantech’s thoughtful effort to help integrators flexibly develop market-sensitive solutions and seize those promising business opportunities! Advantech introduced MI/O Extension to assist system integrator in quickly providing optimal solutions to their clients, while still securing the competitive edge in key vertical industrial technologies. 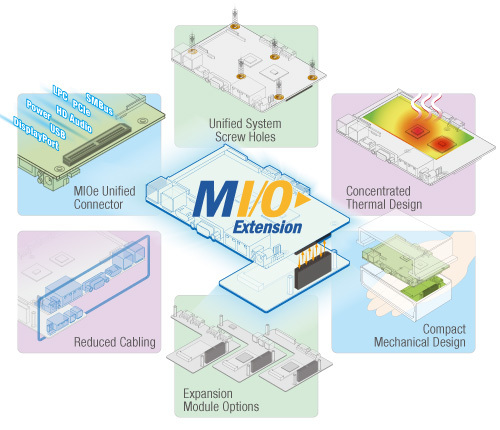 MI/O Extension has one unified MIOe connector which supports additional extended interfaces that give more flexible support to bundled I/O modules, either from Advantech or modules designed by the customer. Advantech has developed a series of modules that are ready for future interface designs and made for flexible vertical application demands. MI/O Extension provides unified screw mounting holes for easier thermal solution assembly and system integration. Advantech MI/O Extension SBC is designed with a concentrated thermal design so that all heat generation is on the top side only, dispersing heat via the heatsink or the heat spreader with better results. Thermally sensitive parts on the bottom side to prevent heat problems. MI/O Extension single board computers come with unified I/O connector coastlines, CompactFlash and PCIe Mini Card locations. An area under the board is also designated for a 2.5” hard disk. The structural uniformity helps eradicate possible problems with integration during future upgrades. Compact mechanical designs and simplified layouts address the major concerns of embedded system integrators.